The Elite 80 Heat from Alpina is a fantastic option for the beginner to solid intermediate skier looking for warm feet in a shell that fits medium width feet and leg shapes. The InTemp Heating System uses a USB cord to charge the hidden battery pack that heats coils wrapped in the liner to keep you skiing your best with warm feet and improved balance. Three heat settings will keep your toes the perfect temperature on the mountain. 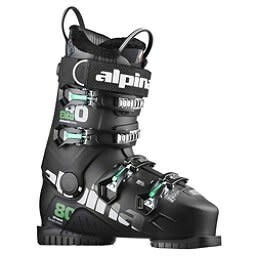 Alpina's X-Frame Construction reduces the total weight of the boot while adding rigidity and energy transfer to specific points of the shell to improve your control and responsiveness. The VCP (Volume Control Plate) allows you to swap the bootboard between the right and left boots for a perfectly dialed in fit. If you want a ski boot that will keep your feet warm and allow you the control to improve your skills on the hills quickly, the Alpina Elite 80 Heat is a perfect option.